"Allen has a great knowledge of the golf swing and what makes it work. He puts his suggestions into simple thoughts that do not confuse the student. Dave says it all when he describes to his readers of The Short Game Bible that the best ball striker he ever tested was Lee Trevino. Who was the second best of all time? Pelz candidly mentions that it was Miller...not Johnny Miller, but Allen Miller, a former PGA Tour player and teaching professional in Western New York. This is a testimonial to the purity of Allen's swing, and his unique ability to make that little white ball do literally anything he wants it to do. 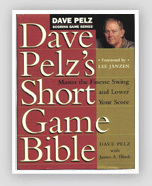 Dave Pelz is the author of the acclaimed best selling books, The Short Game Bible, and The Putting Bible.